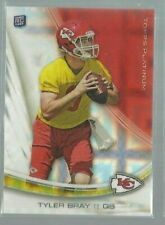 2013 Sage Hit The Write Stuff Tyler Bray. Product: Sage Hit. Rookie: Yes. Set: The Write Stuff. Year: 2013. Serial Number: 1/25. Add to Favorites. Hand Signed: Yes. You will receive the card in the picture. Player: Tyler Bray. Set: 2013 Score Rookie Signatures. Item#: 432. Year: 2013. NO RESTRICTIONS - MIX and MATCH!! (What appears to be scratches or creases may just be scanner marks or lines, feel free to ask). YOU RECEIVE ITEM LISTED IN TITLE ONLY AND NOT ALL THE CARDS. This card is from 2013 Upper Deck SPx Football. Only 475 of these cards were produced! Baseball RC Lots. Basketball RC Lots. Football RC Lots. Hockey RC Lots. Racing Single Cards. Poker Single Cards. 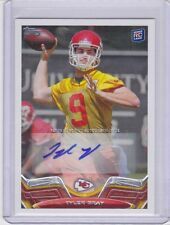 2013 Panini Certified ROOKIE Card Of Tyler Bray. This Card Is limited to 250 ever made in the world ! Card # 293. This has been accepted and understood in our industry and we consider those cards to be NM. ALL CARDS ARE AT LEAST NEAR MINT unless otherwise stated. The majority of our cards listed on our site are usually defect free. Player: Tyler Bray. 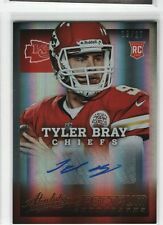 Set: 2013 Panini Prizm Autographs. Item#: 293. Team: Kansas City Chiefs. Manufacturer: Panini Group. Sport: Football. Attributes: Autograph. Year: 2013. Player: Tyler Bray. Team: Kansas City Chiefs. Card#: 294. 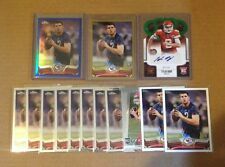 Set: 2013 Prestige Extra Points Red Autographs. Attributes: Autograph. SetType: Parallel Insert. Year: 2013.